Hello, birding friends! August is almost upon us, and our annual Field Guides staff meeting is coming up in three weeks…more than thirty of us are looking forward to catching up in person and talking about next year’s plans and beyond. It should be good fun, and we’ll share some pics after the meeting. There’s much to see in this emailing: a fresh July Recent Photos Gallery with more than 100 great images from numerous recent departures (the Pauraque below in South Texas by guide Tom Johnson is just one sample). Also linked below: new and returning tours for 2020, tours with roommate options if you’re traveling solo, cool birding news in the media, videos from Brazil’s Rio Roosevelt and Peru’s Magnetic North, a fresh batch of 14 recent triplists, and 12 updated itineraries for 2019 tours, as well as remaining spaces on our August-December tours. Enjoy, and we look forward to seeing you in the field! Our Scheduling Committee has been working diligently with guides to finalize the 2020 schedule details. As part of that process, they have been evaluating both new tour ideas and the possibility of bringing back some itineraries we’ve run in the past. Here are some recent additions. 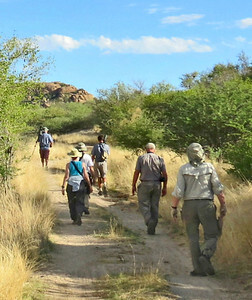 Guide Joe Grosel, based in South Africa, will be guiding a new Southern Africa Spectacular itinerary in July 2020 that will visit several marquee destinations in three countries, including Kruger National Park in South Africa, Victoria Falls in Zambia, and Chobe National Park in Botswana. We have a preliminary description and some of Joe’s beautiful images on the tour page, with lots more info to come as we work up the official itinerary, checklist, etc. If you would like to hold space on this tour, contact our office. Guide Jay VanderGaast is returning to his stomping grounds as he brings back to our schedule Canadian Rockies: Alberta — a summer itinerary with fabulous western prairie and mountain birding amidst eye-grabbing scenery. Dates are Jun 13-23, 2020. Participants traveling recently with guide Terry Stevenson requested a tour to the endemic-rich southern reaches of India, and Terry’s been missing his travels there…so Southern India: Western Ghats Endemics is back on the calendar! Dates are Nov 1-21, 2020, with numerous geographically sourced bird names on the menu: Malabar Trogon (and M. Gray Hornbill, Pied-Hornbill, Barbet, Parakeet, Lark, Whistling-Thrush, and Starling); Wynaad, Nilgiri, Palani, Ashambu, and Banasura laughingthrushes; Nilgiri Blue-Robin and Flycatcher and Flowerpecker and Pipit; plus another 300 or so species on the list of possibilities. Terry guided this tour in 2016, 2014, and 2012…click to see the triplists. Traveling solo, need a roommate? Puerto Rico 2019: It’s on! Guide Tom Johnson has been keeping in touch with our various contacts on the island, and from a birding standpoint the news is good for both access and the logistics we need for our tour. So we’re heading back (after having to cancel two full tours in 2018 due to the hurricane aftermath). Dates are Mar 17-23, 2019. We’re looking forward not only to seeing a bunch of Puerto Rico endemics but also to visiting our friends down there and giving their businesses a much-needed shot in the arm. Contact our office if you’d like to hold space; you can see the complete 2019 itinerary at this link. Speaking of Tom, he just appeared in a radio interview on the joys of birding in Big Bend NP in Texas. It’s three minutes long and hosted by Texas Standard, which comes out of KUT, Austin’s Public Radio station. If you have a listen, you’ll get to hear not only Tom but Colima Warbler and Elf Owl, too! Two interesting articles caught our eye recently. The first is one in the New York Times about the Colombian llanos, a region featured in guide Jesse Fagan’s Colombia: The Llanos & More tour, with our next departure scheduled for Nov 11-21, 2018. The llanos are seasonally flooded grassy plains that span parts of Colombia and Venezuela—their version of the pantanal, if you will. Our itinerary visits the very lodge featured in the article about this area rich in birds and history, and the piece is a fun read. 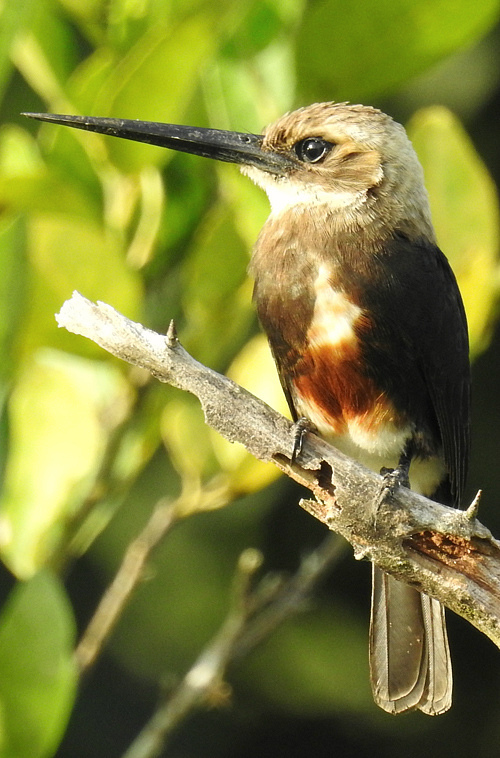 At right is a specialty of the region, a Pale-headed Jacamar, by Jesse. The second piece from The Atlantic is an exciting recounting of the discovery of the nest of a longtime ornithological enigma, Ringed Storm-Petrel. Where? Of all places, out in the middle of the barren Atacama Desert in northern Chile! It took a lot of sleuthing over a number of years, and the article reads like a mystery short story. It’s amazing how many gaps in our bird knowledge remain in this modern age. A couple of fun video clips from recent tours below, just click on either image to see the video. First, an exciting run up Brazil’s Rio Roosevelt (the famous River of Doubt) to a morning birding’s destination by participant Jonathan Newman (there will be lots more to see about this wilderness tour soon in the 2018 triplist). Next, check out guide Jesse Fagan’s clip from our recent Peru’s Magnetic North tour of a diminutive Ochre-fronted Antpitta doing its body-rocking thing—a characteristic behavior in the genus Grallaricula. Why? Who knows? But it’s fun to watch. Want to organize your own tour with a group of special birding friends and one of our staff guides or for your local birding club? We regularly put together private departures for groups of 6 or more to many different destinations, and they are invariably a big hit. Here’s an example of a Namibia & Botswana tour’s illustrated triplist, with guide Terry Stevenson, and there is one more example from Portugal among the recent triplists above. Just contact our office to start planning your group’s next great birding trip. Check our listing below for space still available on select tours from August through December. Included are openings on two distinctive Colombia itineraries with Jesse Fagan in November: our Colombia: Cali Escape tour, from which participant Steve Parrish brought home the lovely Multicolored Tanager image last year, and our Colombia: The Llanos & More tour, to the eastern reaches of this rich country (see one of our lodges featured in the NY Times article linked above). As you can see by the dates, they can be taken back to back, too, if your schedule allows. Click on any image or link below to see the detailed itinerary for the following 2019 tours. Lots of info in these, and some great images as well!